Referencing the stars’ 12-inch height differential is an ongoing visual punch line in this comedy action flick. 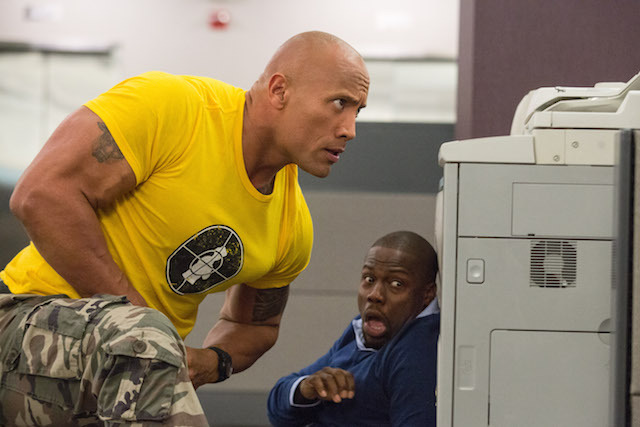 While hardly raising the bar in action-comedy, “Central Intelligence” is still a fun, irreverent, laugh-out-loud film. The story follows a one-time bullied geek, Bob (Dwayne Johnson), who grew up to be a lethal CIA agent coming home for his high school reunion. 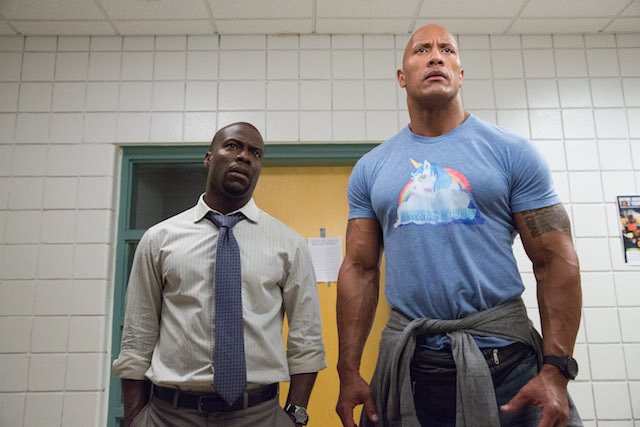 Claiming to be on a top-secret case, he enlists the help of former “big man on campus” Calvin (Kevin Hart), who was once the smartest and popular guy on campus, but is now a self-loathing accountant stuck in a dead-job and longing for his glory days. Within hours of Bob’s seemingly casual request for Calvin to analyze some financial data, things takes a suspicious turn and Calvin’s soon caught up in a whirlwind caper that involves gun-toting agents, stolen encryption codes, espionage, and numerous double-crosses. The plot may be as predictable as the California weather, but the pairing of Johnson and Hart is what garners the most giggles. As unlikely former high school friends, and even unlikelier spy-busting, world-saving, accidental partners on the run, director Rawson Marshall Thurber (“We’re the Millers,” “Dodgeball”) offers a fun explosive action-comedy flick. Referencing the stars’ 12-inch height differential is an ongoing visual punch line and gags on subjects from Taylor Swift’s dating dilemmas to lines from John Hughes’ “Sixteen Candles” add a nice dose of hilarity. Johnson is definitely the big surprise here. Decked out in a tight fitting unicorn T-shirt, a knee-length pair of denim cut-offs and a black fanny pack, his timing is impeccably spot-on and so endearing it quickly becomes the more engaging and amusing of the two. There’s a hilarious scene where he squeezes into a set of Hart-sized pajamas and refers to Hart as a “snack-sized Denzel.” All of this is funny and proof of the quiet career intelligence of one who knows when it’s smart to play dumb, and is canny enough to acknowledge some cross-gender appeal. Hart unsurprisingly, continues to play Hart: reliably amusing with short spurts of his trademark improvisation, which we’ve seen in his past flicks. With a supporting cast that includes Amy Ryan as the CIA agent on their tail, Aaron Paul (TV’s “Breaking Bad”) and Danielle Nicolet (TV’s “The Game”) as Hart’s wife, it’s all easy to take in thanks to the engaging performances from the two leads. The plot isn’t original, but the humor works because the characters are so likable and the humor is the reason we see these films. As much as the movie is about these two guys dodging the CIA, underneath it’s a character story about who we become as adults. The movie plays on a reversal of expectations – both for its main characters and the actors who bring them to life. 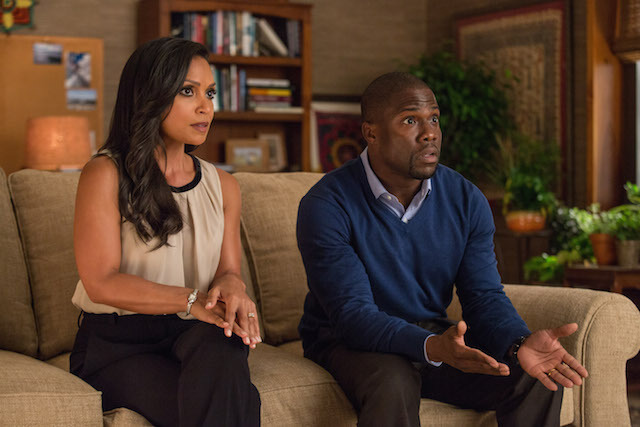 By offering a snapshot view of these two in their younger days before joining them as adults in the here-and-now, the story packs a measure of truth that anyone who has lived through that time can relate to.Chaotic and far-fetched “Central Intelligence” is still funny enough to have audiences rolling in the aisles.